Heat 1/2 spoon oil in a pan add onions sautee till it becomes soft and translucent . Add tomatoes and fry them all together for about 5 minutes . Remove them from heat and let it cool for few minutes. Grind ‘em into a smooth paste. Keep it aside. Heat 3 tbsp of oil in a pressure cooker, add the ground paste and fry it in the oil for 2 to 3 minutes.Then add the ginger & garlic paste . After the raw smell off ginger and garlic goes off, add the mutton and mix it all well. Fry the mutton with the masala for 5 to 8 minutes in medium flame. Now add the red chili powder, turmeric powder, coriander powder , black pepper , salt and half cup of water into it. Stir it well so that all of the ingredients mix together and close the lid of the pressure cooker. Pressure cook it until the whistle goes off 4 times. After that remove from heat and keep it aside. Heat the remaining oil in a kadai/pan add cloves, cinnamon, bayleaves, fennel seedsand curry leaves. After the seeds sputter add the pressure cooked gravy in to it . Boil it for a few minutes or till it comes to complete boil. If the gravy is little watery leave it in a medium heat until it becomes a bit thick in consistency and remove from heat. 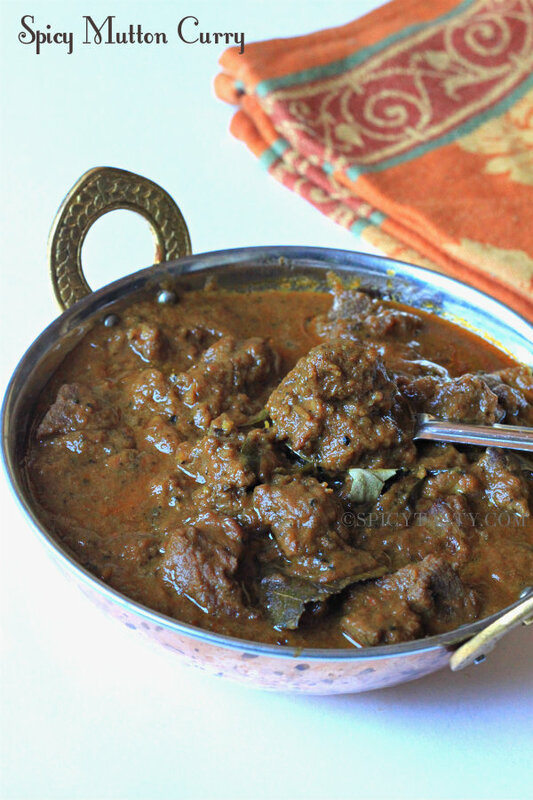 This entry was posted in Food and tagged home cook, indian, mutton curry, spicy by Miss P. Bookmark the permalink.